(Background) During esophagojejunostomy using a circular stapler after laparoscopy-assisted total gastrectomy(LATG),placement of the anvil head via the transabdominal approach proved difficult. 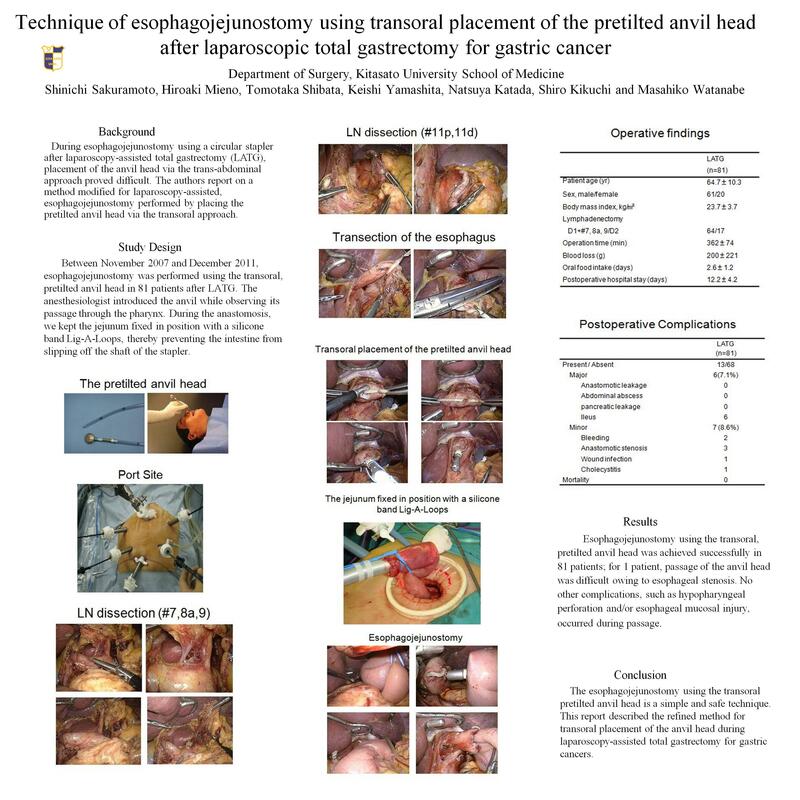 The authors report on a method modified for laparoscopy-assisted, esophagojejunostomy performed by placing the pretilted anvil head via the transoral approach. (Methods) Between November 2007 and August 2011, esophagojejunostomy was performed using the transoral, pretilted anvil head in 83 patients after LATG. The anesthesiologist introduced the anvil while observing its passage through the pharynx. During the anastomosis, we kept the jejunum fixed in position with a silicone band Lig-A-Loops, thereby preventing the intestine from slipping off the shaft of the stapler. (Results) Esophagojejunal anastomosis using the transoral anvil head was achieved successfully in 76 patients; for 1 patient, passage of the anvil head was difficult owing to esophageal stenosis. No other complications, such as hypopharyngeal perforation and/or esophageal mucosal injury, occurred during passage. No postoperative complications occurred, except for 3 patient who developed anastomotic stenosis, in whom mild relief was achieved using a bougie. (Conclusion) Esophagojejunostomy using the transoral pretilted anvil head is a simple and safe technique.